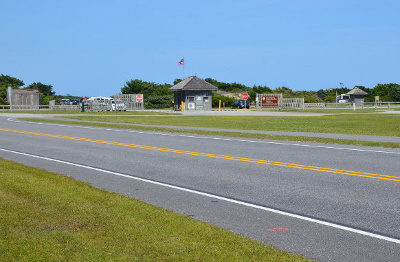 The National Park Service campground on Ocracoke is one of four campgrounds within the Cape Hatteras National Seashore. It is located approximately three miles northeast of the village on the ocean side of N.C. Highway 12. Campsites are all on level ground and are protected from the ocean by barrier dunes. No shade is available so make sure you bring your own. The Ocracoke campground is the only one that accepts reservations, which are recommended. For information on availability and to make reservations, visit www.recreation.gov or call 1-877-444-6777. For detailed rules and regulations visit www.nps.gov/caha/planyourvisit/campgrounds.htm.